Scornets (ハチスズメ?, lit. : "Hummingbird") are tiny hornet-like cone-shaped creatures in Pikmin 3 that are lead by the Scornet Maestro. These enemies are capable of making coordinated formations, and can capture and eventually kill Pikmin by picking them up and then flying around the Scornet Maestro. These Pikmin can be freed by having Pikmin thrown at the Scornet. If a captured Pikmin is not freed, over time it will be carried away and lost. The first swarm of about 30 individuals appears just after a lily pad river ride. When found alone, these creatures as much less uniform and easier to defeat. The only other swarm found is during the Scornet Maestro boss fight, and use three different attacks: the cone, rectangle, and circle formation strikes. In Mission Mode, a group of 30 Scornets are present in Twilight River Remix. Scornets look similar to the Scornet Maestro, which controls them using its harp-like beak. Under the Maestro's control, the Scornets will come together to form unique shapes, each with their own attack. When found alone, however, these creatures are uncoordinated and have only one attack. Whether found alone or with the boss, the Scornets' attacks will result in captured Pikmin being carried around in a circle for a set amount of time before being flown away and killed. 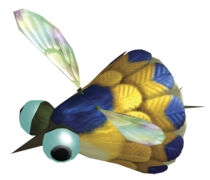 The Pikmin can, however, be freed if the Scornet holding them is defeated, which can be done easily – in one hit in fact, as Scornet's are extremely fragile, not even having health meters. Using ground based Pikmin is practically useless. The best way to defeat a swarm is to use a large amount of Winged Pikmin in order to outnumber them. A group of Scornets is found shortly before you get to the Scornet Maestro, hovering around aimlessly on the far side of the river. Their attacks are uncoordinated and their dead bodies are not retrievable. When you fight an organized army of them in the boss battle, all 100 of their bodies are retrievable. After taking them to the Onion, it is not recommended to come back for more, because they are worth only one seed, and it is a long run to and from the landing site. "Scornet" is a play on the word "hornet", although the origin of the other part of the word is debatable. It is possible that it stands for "scorn" (which means "to treat with dislike") or "score", particularly in the sense of a musical score, because of the Scornet Maestro. This creature's Japanese name is ハチスズメ?, which literally translates to hummingbird. Internally, it is known as mure, or むれ? (lit. : "swarm"), referring to how they work in swarms. French (NoE) Apidar Portmanteau from Latin apis (“bee”) and French dard (“sting”). Scornets during the introduction to the Scornet Maestro battle. The data file explaining Scornets. This page was last edited on January 29, 2019, at 01:13.